Please send me more information on Tropicat Cruises! Come and experience Cabo’s most luxurious super-cat. At 65’, this catamaran is truly in a class all its own. With seating for 90, and two full-size nets in front for lounging, Tropicat offers first-class accommodations. 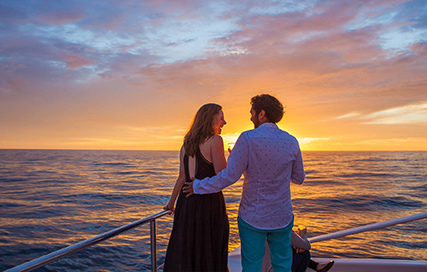 Whether you plan on spending the day sailing in the azure waters of the Sea of Cortez, looking for whales, or enjoying a gorgeous Cabo sunset, Tropicat is sure to deliver the experience of a lifetime. Tropicat features a full-size kitchen with a wrap-around bar, two large restrooms, a waterslide, fresh-water rinse, and much more. For groups from 30 to 90. Perfect for weddings, birthdays, corporate groups, bachelor/bachelorette parties, and anniversaries. Equipment: A state-of-the-art catamaran equipped with waterslide, two restrooms, cellular phone, vhr radio, and all Coast Guard-approved safety equipment. Tour Includes: Premium wines, international bar and appetizers. Round trip transportation not included. Listen to today’s most popular contemporary jazz music while you sail into the Pacific for a gorgeous Cabo sunset. Includes appetizers and a premium bar serving fine international wines. Two-hour Pacific sunset tour, including snacks (assorted cheeses and meats with crackers, veggie platter and dip), open bar (beer, margaritas, rum drinks), sodas and bottled water. Two-hour tour including snacks (cheese and crackers, veggie platter with dip, fresh fruit), open bar, sodas and bottled water. Available January through March. Prices quoted include IVA/sales tax, port charges (if applicable). All tours depart from Dock #4, next to the main dock.